Kali – perhaps the most dramatic Devi in Hindu mythology. She is depicted naked, hair unbound, sitting or standing on top of Shiva, sickle in hand with a garland of male heads around her neck and her bloodstained tongue sticking out. What distinguishes her from all other goddesses is her nakedness, her unbound hair, her unbridled lust and that she dominated a male figure – identified as Shiva or Bhairav. But the male body she stands on is not a demon she has defeated but her husband whom she awakens. In that sense, she is the goddess that makes him a god. Kali is identified as the most primal form of nature that is unaffected by the rules and opinions of humanity. She is power – raw and elemental, both venerable and frightening. She refuses to be invisible. Her long free-flowing hair depicts her freedom from convention and the confines of conceptualization. Kali’s tongue is a symbol that mocks the limitations of, as well as the assumptions of the human gaze. Her complexion is deep blue, like the sky. The sky is limitless and so is she. Kali is symbolic of the one who confronts his/her fears, breaks free from social structures, customs and beliefs that limit him/her. Worshipping her is recognized as overcoming one’s fears and when one succeeds in doing so, he becomes a ‘vira’ – a hero! The sword and trident are Kali’s weapons of choice to annihilate the wicked that have gone beyond the possibility of reformation: murderers, pedophiles, poachers, and rapists. She uses the noose to capture them. Our designers at Tjori designed an entire collection devoted to this fierce goddess. She depicts the woman of today. This collection is for the woman of today! This piece is bound to make a statement. 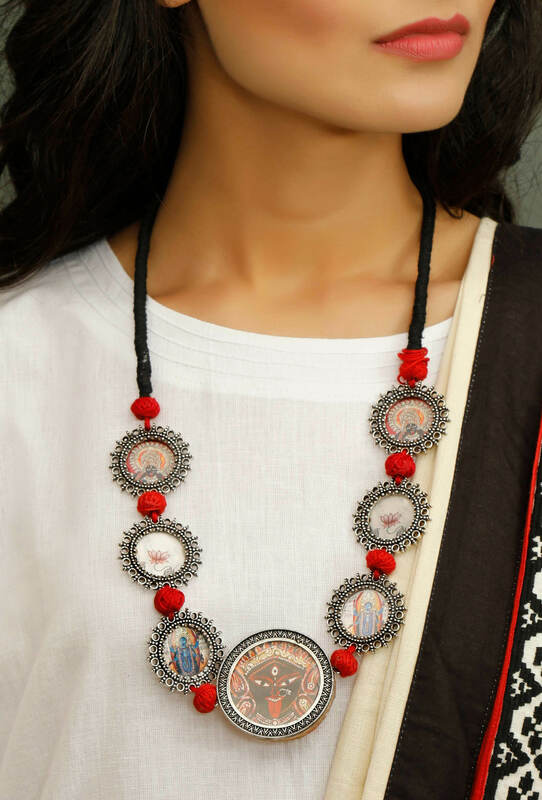 With seven brass pendants depicting the goddess Kali, this necklace with its stunning illustrative depictions and intricate design will be an ice breaker for sure. 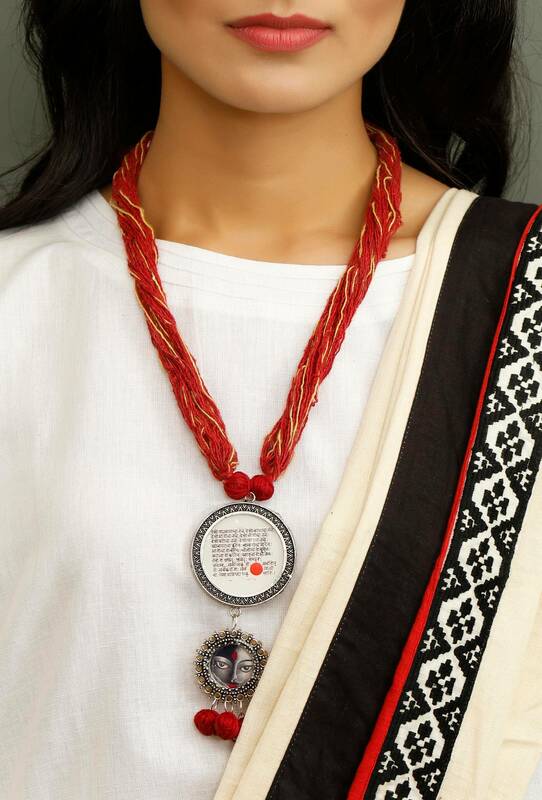 The use of traditional and auspicious Indian saffron threads (also called mauli) lend a stunning look to this pendant. This dazzling piece of jewelry has two brass pendants, the bigger one depicting Sanskrit verses and the other depicts the goddess. 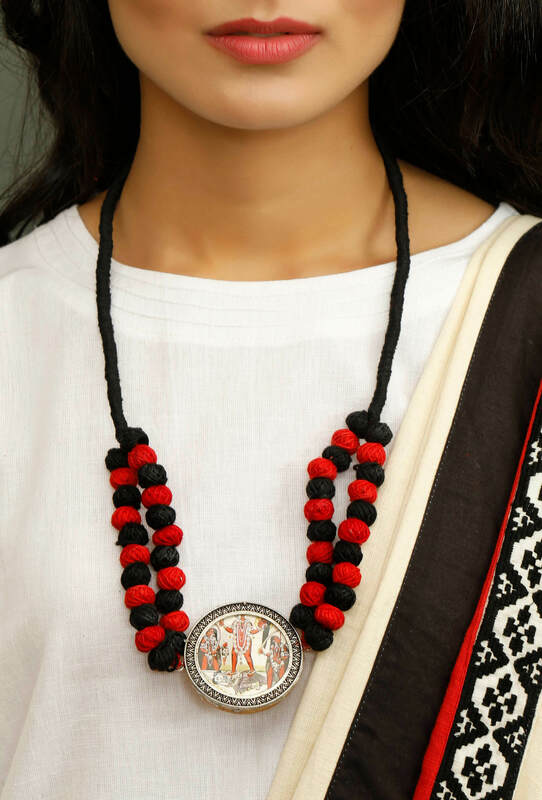 There is a striking play of threads that are woven like beads in this one which is eye-catching but not in a bad way. With a brass pendant again that depicts and glorifies the Kali, this will definitely make heads turn.